A transport wheelchair is an especially useful home mobility aid that is designed for easy transference from a wheelchair to chair, sofa, bed, toilet or into a car seat. disabled person, not to mention embarrassing at times. people to be independent and more mobile than ever before. in the home is the transfer or transport wheelchair. transference from a wheelchair to chair, sofa, bed, toilet, shower seat or into a car seat. They are also convenient for short distances such when used on residential elevators for the ride to a lower floor in the home. They typically have fold-down backs and detachable swing-away footrests. Sometimes called companion or rollabout chairs, transport wheelchairs are designed for ease of use for the caregiver or attendant other than the disabled person. This type of wheelchair folds up when not in use and is quite portable. The upholstery can usually be removed and washed for cleaning. Standard - This type typically weighs around 26 pounds. They are suitable for people in the 250 to 300 pound weight range. Most standard transport chairs have folding backs for easy, compact storage. Lightweight - These usually weigh 22 pounds, with some as light at 16 pounds. Their weight capacity is between 225 and 300 pounds. These wheelchairs usually cost more, but they are much easier for a companion or caregiver to push and lift. Heavy-duty - These are designed for a weight capacity of over 300 pounds, and some are capable of holding weights up to 450 pounds. Also known as bariatric wheelchairs, these have large width seats, large casters, and reinforced cross braces for additional support. Transport chairs are convenient, lightweight devices for moving a disabled person from one place to another. They are beneficial for caregivers because they are easy to fold and lift into vehicles. They also are easily packed into almost any style of vehicle. You can find both transport pediatric wheelchairs as well as adult transport models. Since the wheels on a transfer wheelchair are smaller than those on a standard wheelchair, disabled people cannot use these chairs by themselves. A caregiver must push the chair for them. 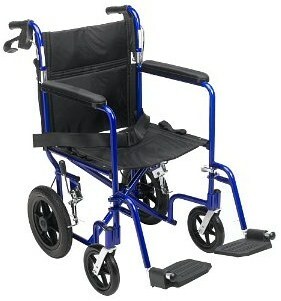 Transport wheelchairs are available for purchase online or at a medical supply store. The cost of a chair ranges from $100 to $350 or more. Medicare will cover durable wheelchairs and walkers with a doctor’s prescription. Transport chairs, however, are usually not covered by Medicare. Things to consider before purchasing this mobility aid include the chair’s frame, armrests, footrests, seat widths and material, wheel size, fold-ability and storage, and carry straps for ease of lifting. Most sellers will honor manufacturer warrantees for transport wheelchair parts, and they will sell parts not covered by a warrantee for a reasonable price.